NASHVILLE, TN — The Nashville ATHENA Leadership Awards Program announced its 2019 award recipients recently at the Country Music Hall of Fame. Mendy Mazzo was honored with the 2019 ATHENA Award. Brenda Gadd received the Young Professional Leadership Award. 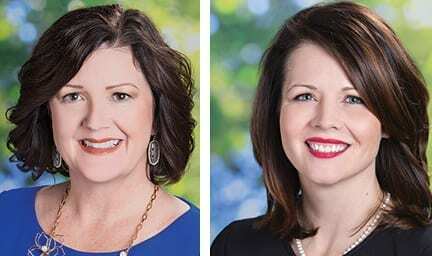 Mazzo is among 26 ATHENA nominees selected this year by middle Tennessee organizations and associations, and Gadd represents a class of 25 Young Professional Award nominees. Mendy Mazzo is the Corporate Senior Vice President of National Business Development at Skanska USA. Mendy has a passion for issues related to diversity and inclusion and was instrumental in the development of Skanska’s Diversity Business Program and is Immediate Past National Chair & Founding Member of the Skanska’s Women’s Network (nominating organization). Mendy was honored by the Nashville Business Journal as a Woman of Influence in 2012 and has received numerous recognitions, in addition to serving on multiple non-profit organizations including Habitat for Humanity, Girl Scouts of Middle Tennessee, Cumberland Region Tomorrow, Ronald McDonald House Charities of Nashville, Hands on Nashville and Josie Mazzo Children’s Charities.. Nominated by CABLE, Brenda Gadd is the founder and president of Rethink Public Strategies, a woman-owned public affairs firm, where she represents nonprofits and socially conscious companies in the public policy and political arenas. Brenda previously served as the Public Policy Director of the Tennessee Bar Association and Vice President of CivicPoint. She managed the successful statewide retention election of three Tennessee Supreme Court Justices and became the first woman to manage three statewide successful candidates, including a successful statewide Democratic candidate. She also served as Chief of Staff in the Tennessee Senate and then as a Legislative Liaison in Governor Bredesen’s administration. ATHENA continues to be a premier program, powered by CABLE. The annual event is organized and sponsored through the collaborative efforts of local women’s organizations in partnership with local businesses, corporations and individual sponsors, unlike other cities, which rely upon their local Chamber of Commerce. Launched in 1993 through the support of the Patrons Society and local sponsors, the ATHENA Scholarship Program awards middle Tennessee high school females and young women, both traditional and non-traditional, scholarships for continuing their education.